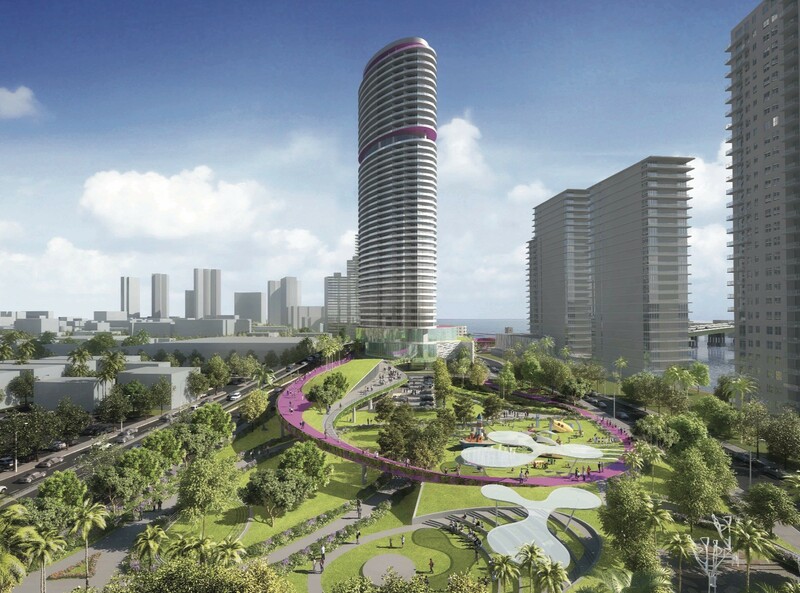 It took 135 meetings and four and half hours at this week’s Miami Beach City Commission meeting, but Russell Galbut is now only one vote away from securing the zoning changes he needs to build a tall tower on the 500 block of Alton Road and an adjacent resilient public park. On first reading, Commissioners agreed to a height of 519 feet for the tower and a 3-acre park to be deeded to the City. There are still a few items to be worked out before the final vote next month but one of the most contentious, the ability to have short term rentals in the building, was taken off the table by the developer. Galbut also wants nine hotel units in order to offer amenities to all residents but that proposal received mixed responses from residents and Commissioners and was not approved on first reading. With further defined plans for how those units would be used, the issue may be reconsidered during second reading in December. 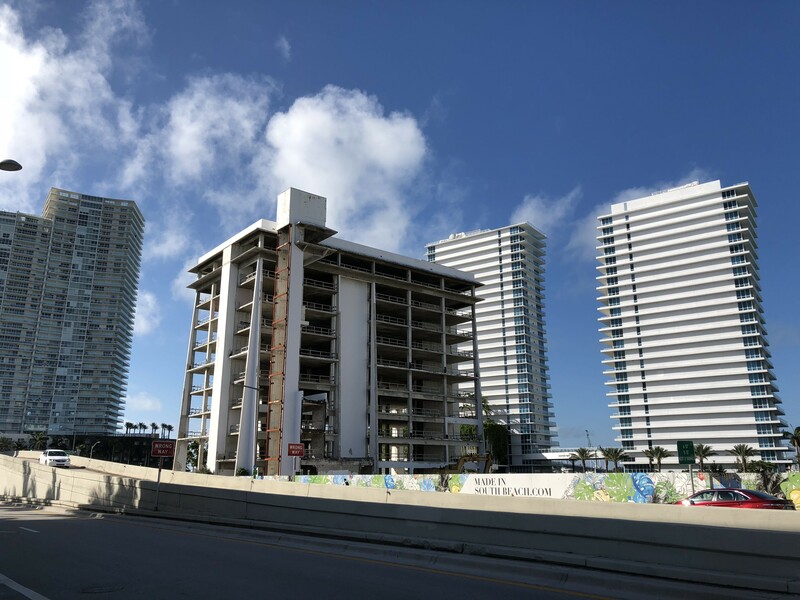 Mayor Dan Gelber challenged the community and Galbut earlier this year to work together on a solution to finally develop the area which now contains the shell of the old South Shore Hospital and vacant land at one of the main entrances to Miami Beach. The currently approved project for the site includes a series of low-rise buildings with little greenspace and 510 residential units (below). In this proposal, the number of units would be capped at 410 in a 44-story tower (shown in photo at top) which will be located in the far northeast quadrant of the 500 block away from other residential buildings. The value of the park land, located in the 600 block, has been estimated by the City to be $80 million and the cost to construct it, $18.5 million, all donated by Galbut and deeded fee simple to the City following its completion. The retail space has been reduced from 75,000 sq ft in the currently approved project to 15,000 sq ft.
Galbut will also construct the Baywalk behind 1000-1200 West Avenue (with a contribution from the City); a platform to connect the north and south sides of Fifth Street via a pedestrian bridge that is in the General Obligation Bond approved by Miami Beach voters earlier this month; and provide easements for additional pedestrian and vehicle rights of way, including the potential for an additional lane leading to the MacArthur Causeway. In order to bring the project to fruition, Galbut needs zoning changes to allow him to combine the FAR (floor area ratio or density) allowed on the site and move it to the tower. As he has noted on many occasions, the project does not require more FAR, which would require a public vote, but rather an aggregation of it on the 500 block. In a video showcasing the park, architect Ray Fort of Arquitectonica spoke about the resiliency components. “Miami Beach really sits at the epicenter of the discussion regarding sea level rise,” he said. “This project is really intended to show how resilient of a community Miami Beach can be. 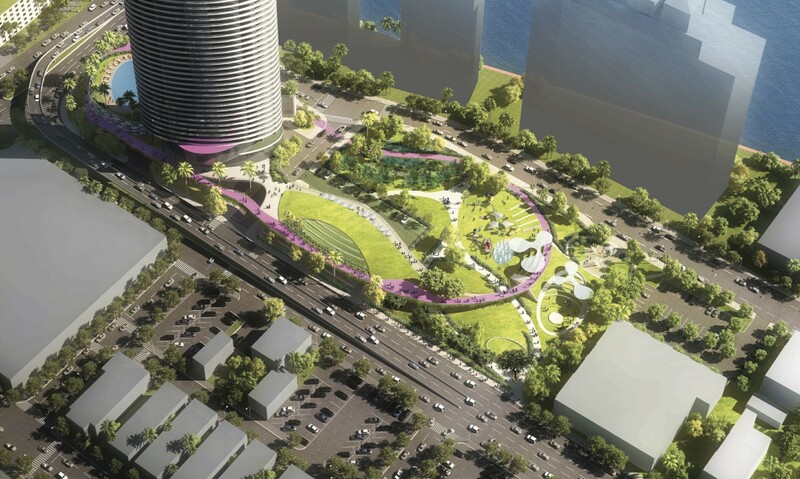 The park itself becomes that example.” The park will include a flood protection basin, native plants, berms and bioswales, water features, green roofs, and a system of elevated pathways. 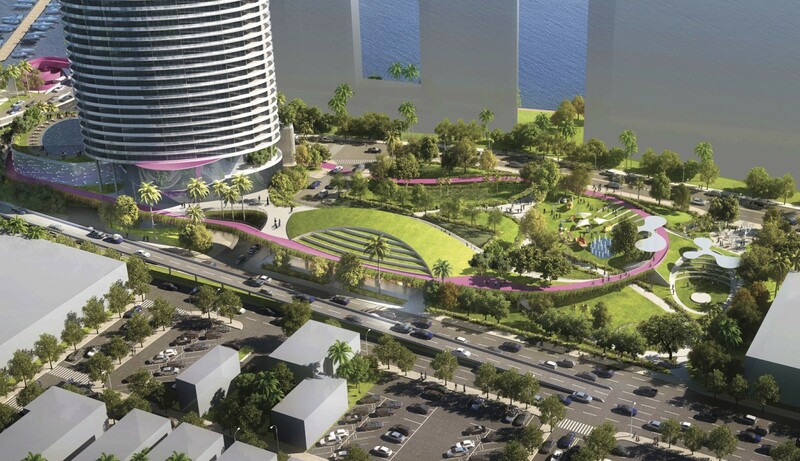 A pink walkway will make a loop that is 1/3 of a mile connecting a children’s play area, a fitness area, dog park, outdoor café, and the retail space. When the idea of hotel units was raised at last month’s Planning Board meeting, Board members did not see an issue with it but members of the community raised concerns about short term rentals and more transient uses creating a negative impact on the residential neighborhood as well as the potential for more traffic. He wants “a small hotel that caters to the existing condominium unit owners” similar to other nearby luxury buildings. He noted that Fisher Island has 15 hotel units, the Four Seasons in Surfside has 45, and the Ritz Carlton Residences, 8 units. Addressing a couple of concerns about the park design, he noted one had been eliminated. There is no longer a tunnel planned for the site, the park is now mostly on grade. However, Galbut did object to a staff recommendation to eliminate all parking entirely around the retail shops. He said the number has been whittled down from 144 spaces originally to 70 and now down to 30 spaces. The area could also be used for weekend markets and outdoor dining according to Fort. Herb Frank, a Miami Beach United Board member, voiced the group’s opposition to the project on the grounds that it violates the City Charter by “circumventing a required public referendum.” Frank said the Charter states that “FAR shall not be increased by zoning, transfer or any other means” unless approved by voters. However, most of the community objections and requests are now down to a few: no hotel units, tear down the old South Shore Hospital building immediately, and open the park as soon as possible. After months of sometimes heated and very passionate discussions, at this meeting speakers on each side took a more positive tone, complimenting and thanking each other, City staff, and the Mayor and Commissioners. Notably, Gelber used the tradition of the mayor calling upon an audience member to lead the Pledge of Allegiance at the start of the meeting to ask Galbut and community activist Frank Del Vecchio to jointly lead the Pledge. The two have sparred often over the project but stood side by side voicing the Pledge in unison. When Del Vecchio spoke later he said, “We’ve come a long way and I think we’re on the threshold of having a great project.” He did suggest the potential of decreasing the width of the parking pedestal through a reduction in parking if the Commission was willing to entertain that as a means of creating more pedestrian rights of way and more green space. While height had been a point of contention up to this point, none of the Commissioners or Mayor had an issue with the 519 feet as recommended by the Planning Board. City Staff and the Commission’s Land Use and Development Committee had recommended 484 feet. Instead, they were more interested in the other components of the agreement such as size of the park and the hotel use. Planning Director Tom Mooney said City staff believed nine hotel units “is much more manageable” than the Planning Board’s recommendation of 60 units or 20% of total units whichever is less. Prior to second reading, he said staff could get “an idea of what the operation of those units will be.” Gelber and Commissioners John Alemán and Ricky Arriola said they would support well defined “amenity units” with Alemán suggesting a provision that the number couldn’t increase over time. 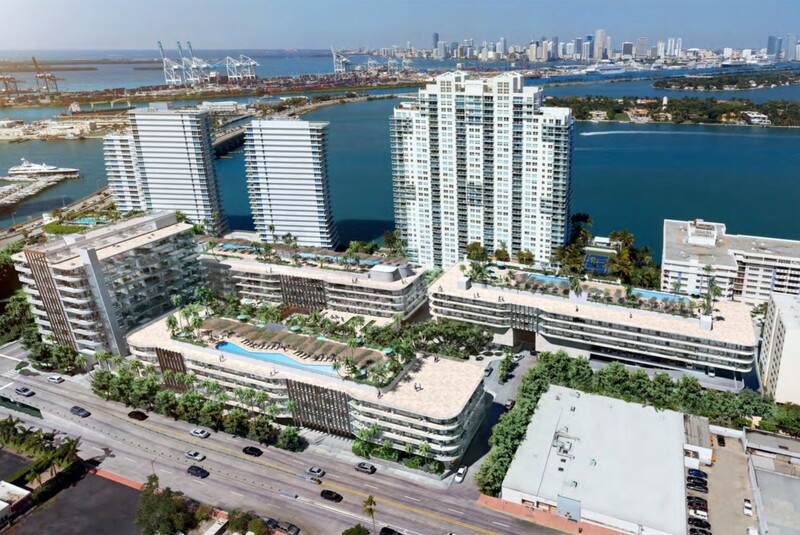 The other four members of the Commission, Mark Samuelian, Micky Steinberg, Kristen Rosen Gonzalez, and Michael Góngora said they opposed any hotel uses so, for now, the provision was not included. Commissioners also supported revising a provision in the agreement to reflect an outside completion date for the park of four years versus eight with sequencing of construction in the development agreement to deliver sections of the park earlier if possible. A couple of other legal and fee issues will be worked out over the next 30 days. Following a unanimous vote, Galbut jumped up, shook Del Vecchio’s hand and then hugged him. Second reading and public hearing will be December 12th.